Booked: Brownhill, Wilde. Sent-off: Powell, Baynes. Northwich Victoria: Hinchcliffe, Disney (Wade 76), Collins, Kearney, Short, Johnson, Field, Armstrong, Woolfe, Riley (Roddy 46), Budrys. Subs not used: Fitzpatrick, Smyth, Clarke. Chester: Danby, Baynes, Smith, Taylor, Brownhill, Sarcevic, Brown, Powell, Howard, McNeil, Wilde (Simm 60 (Booth 85)). Subs not used: Duggan, Wright, Holden. Plenty of heat but not a great deal of light was generated in this Boxing Day derby. City held the early advantage and, with cooler heads might have won but in the end were probably thankful to come away with a point. Rivalry between Chester and Northwich has seldom been intense as their paths have not crossed much down the years. But their respective positions in the table going into this match combined with a spat over ticketing arrangements which led to many City followers having the irritation of going to Northwich beforehand to collect tickets had given this encounter something of an edge. Near neighbours Witton had stirred the pot too by offering free parking and the chance for refreshment in their bar to Chester’s travelling supporters. It was a completely impartial offer of course – Witton don’t mind who beat Northwich. It became clear from the kick off that the Vics were going to be in City’s faces and not allow them time on the ball. Pushing forward themselves the home side sought to launch long throws into City’s box – but not literally so as Short, the left back was a leading exponent. Chester were handed an advantage when ‘keeper Hinchliffe dashed out to meet Howard who was in pursuit of Sarcevicvs through ball. The keeper suffered an aberration and fisted the ball away despite being well out of his area. 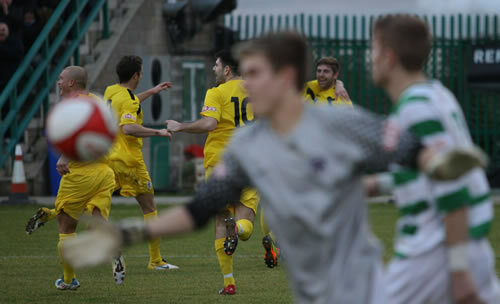 Northwich players surrounded the referee to plead leniency for Hinchliffe but to no avail – off he went. Short donned the grey jersey and was called upon to deal with the subsequent free-kick. Baynes accurate effort proved too much and slipped through the rookie’s grasp and into the net. If City could have pressed home their advantage now the game was there for the taking. Wilde had a good opportunity but mis-hit his shot. Sarcevic and Howard had efforts on target but Long dealt with them well. At the other end Baynes was called upon to clear Woolfe’s lobbed shot over Danby. City then lost their numerical advantage when after a pantomime incident of farcical proportions, Powell was shown a red card by referee O’Rourke. The Chester captain had foolishly allowed himself to be drawn into an altercation off the ball with Disney who had gone down like a sack of potatoes at Powell’s shove. After seeming to play down the incident O’Rourke had then gone over to the far side of the pitch to consult with the distant linesman. Only then did he return to dismiss Powell who now trudged off to be confronted by his tormentor – now ready to return to the pitch after receiving (“ahem”) treatment. Disney possibly – Micky Mouse certainly. After the break Short was relieved of his goalkeeping duties by Roddy. Vics’ body language before the restart seemed to say that they sensed they could get something from the game. They certainly had the lion’s share of possession without creating many clear cut chances. But after Disney had been withdrawn on 76 minutes, Wade, his replacement, popped up at the far post to equalise – smashing another long throw into the roof of the net. Home celebrations were exuberant and when Baynes was dismissed for a lunging tackle with seven minutes to go, City fans could have been forgiven for fearing the worst. Instead it was Chester who went closest to scoring a second when Smith just failed to meet a cross from the right. Chester left Victoria Stadium then with their three point lead intact but rueing two more red cards which may prove costly in the longer term. Marine: McMahon, Fowler, Shaw, M.Brown, L.Barnes, P.Brown, Lawton (Lundon 9), Moore, Rey, Harvey, Dawson (Gargan 64). Subs not used: S.Barnes, Duff, Williams. Chester: Danby, Brownhill (Duggan 62), Smith, Taylor, McGinn, Baynes, Brown, Powell, Howard, McNeil (Simm 71), Wilde (Sarcevic 62). Subs not used: Booth, Judge. Chester came away from the Arriva Stadium with all three points after a resolute second half display that saw them keep out Marine for the last 35 minutes with only ten men following the dismissal of Iain Howard. Once again Blues fans had travelled in large numbers all hoping to see a Chester victory that would keep them in top spot at Christmas. It was the home side however who got off to a flying start and were ahead after just three minutes as Thomas Moore curled a stunning free kick over the Chester defensive wall and past a statuesque John Danby into the net. The Blues were finding it hard to adapt to the wet conditions early on but created chances an don 15 minutes Alex Brown shot over after good approach play by Matty McNeil. Midway through the first half the home side could have doubled their lead as Paul Brown set up Aaron Rey but John Danby raced from goal to make a vital save and deny the Marine striker. Marine were having the better of the first half, Moore tried his luck from another set piece and the Chester defence were relieved his see his second free kick effort fly inches over the bar. Dandy produced another spectacular save to again deny Rae pushing his fierce shot away and clear of danger and the Blues capitalised on that by adding an equaliser with a well worked goal three minutes before the break. Good build up play between Brown and Michael Wilde set up Wes Baynes who slotted the ball home from 12 yards out. Buoyed by their goal Chester started the second half on the attack. Howard saw an effort go wide just after the restart and moment later he was tripped in the box, and despite Marine appeals, referee Barry Lamb pointed to the spot. Matty McGinn stepped up to convert a rather nervy looking penalty that just squeezed under Ryan McMahon’s body as the home ‘keeper guessed which way to dive. Just two minutes later Howard was the talking point again as the Chester midfielder was shown a second yellow card for a handball, assistant manager Gary Jones was also sent to the stands for protesting too much. To strengthen the defence manager Neil Young made changes bringing on on-loan defender Jack Duggan and Antoni Sarcevic for Liam Brownhill and Wilde. Duggan was well placed to clear the danger in a goalmouth scramble as the Mariners pushed for an equaliser and Danby produced another superb double save to deny Rae and Carl Gargan in the dying minutes as Chester held firm against a lively Marine side to claim another vital three points towards their championship challenge. North Ferriby United: Wilson, Williams, Larvin, Harsley (Clarke 74), Foot, Denton, Brooksby, Fry, Bolder, Bradshaw, Davidson. Subs not used: Bennett, Morley, Moy. Chester: Danby, Brownhill, McGinn, Smith, Taylor, Brown, Sarcevic (Baynes 65), Powell, McNeil (Simm 74), Wilde (Ellison 74), Howard. Subs not used: Booth, Holden. Chester booked their place in the second round of the FA Trophy and a trip to Ebbsfleet United after a comprehensive victory over North Ferriby United. Two goals late in the first half set Chester on their way to a second big win over their Humberside opponents this season. Manager Neil Young opted to start with Michael Wilde at the expense of Robbie Booth as the Blues looked to get at their hosts from the start. They did force a couple of early corners which came to nothing before Antoni Sarcevic had the first real chance of the game curling a free-kick just past the post. The Villagers have been on a decent run of form created an opening when Alex Davidson met a through ball but was unfortunate to see his shot deflect off Michael Taylor straight to John Danby much to Chester’s relief. The Blues opened the scoring in the 38th minute but there was a touch of controversy as Michael Wilde prodded the ball home after Matty McNeil appeared to kick the ball out of the hands of home ‘keeper Steve Wilson after he had gathered McNeil’s shot. Chester doubled their advantage in first half stoppage time with a classic breakaway goal involving first touch passing from Alex Brown, Christian Smith, Iain Howard and Wilde who pulled to the ball back for McNeil to stroke home the goal. The Blues carried on the pressure after the break and Wilde put the game beyond doubt with his second goal of the game just three minutes in picking up a loose ball in the box following a Howard corner to fire past Wilson. Wilson produced a good save to deny McNeil a goal before a foul in the back of Sarcevic gave Matty McGinn the opportunity to add the fourth from the penalty spot however Wilson produced another good save to deny the Chester defender and break his 100% spot-kick scoring record. Four minutes later a penalty at the other end was converted as Paul Harsley steered to ball past Danby from the spot to give the home side a glimmer of hope after Brown had fouled Alex Davidson in the area. However, in what was turning out to be an action packed half, Chester restored their three goal advantage just two minutes later with Sarcevic shooting home in the far corner, despite Wilson getting a hand to the ball, following build up play from McNeil and Wilde. Howard added a fifth goal from close range after McNeil had back heeled Wilde’s cross into his path before McNeil also saw an effort ruled out for offside as Chester thought they’d scored a sixth! A late challenge on Danby saw the Chester shot stopper receive some lengthy treatment but he was able to carry on and even had time to make a smart save to deny Danny Clarke a late consolation goal. Booked: Brownhill, Howard, Baynes, Powell. Chester: Danby, Brownhill (Baynes 72), Smith, Taylor, McGinn, Sarcevic, Booth (Wilde 54), Brown, Powell, Howard, McNeil. Subs not used: Ellison, Wright, Duggan. Worksop Town: Worsnop, Gardner, Wood, Young, Shiels, Jacklin, Burbeary (Sharry 66), Hudson, Kiing (Wilson 77), Jackson, McDonald. Subs not used: Warlow, Cotterill, Allott. Back in the old Chester City days, the following scenario would have only produced one result – the club were just one game away from going an entire calendar year without losing at home; the last time they lost at home, captain George Horan wasn’t playing, and he was suspended for this match; and I was a guest on the match sponsor’s table. So inevitably I pitched up at the Exacta expecting a defeat. But there’s some magic about the new Chester FC that seems to over-ride traditional expectations and we emerged from a relatively unattractive game with three points and an unblemished home record so far in 2011. The pre-match stadium tour I enjoyed as part of being a sponsor’s guest gave me a peek into such hallowed areas as the players’ changing rooms and the physio’s treatment area. During our visit to the physio's room we saw Chris Simm’s ankles being strapped up and were given the exclusive news that he had been passed fit to play. But the team sheets weren’t out at that stage and when we saw him tucking into a big lunch not long after, we realised he wouldn’t be featuring. Still, it was promising news for future matches. The starting line-up included Christian Smith joining Michael Taylor at the back, with new signing Jack Duggan on the bench. Simm’s absence meant Matty McNeil was on his own up front, with Michael Wilde on the substitutes’ list. It was an edgy start for Chester, following the minutes’ applause for Gary Speed, who died at his Chester home less than a week before. Worksop had the best of the early chances, including a free-kick which flew over the top of the bar. They also had a ball in the back of the net, but the goal was disallowed for a foul on Chester goalkeeper, John Danby. But just when there were grumblings on the sponsors’ row about Chester “not playing very well”, the team went and proved the doubters wrong. A Robbie Booth free kick into a crowded box was headed home by stand-in captain Michael Powell on the 33rd minute. That bought the home side to life and the rest of the first half was more promising than the opening spell. The second half was still a scrappy affair, but it was a much more encouraging performance from Chester. Wilde replaced Robbie Booth on the 54th minute and looked sharp almost from the off, heading the ball just wide from a Liam Brownhill cross. As the game got a bit more heated, Chester were awarded a free kick in a dangerous area. 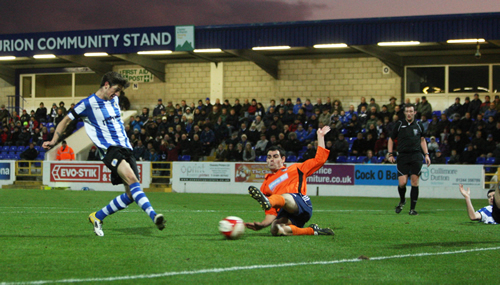 Matty McGinn’s powerful shot only just went over the bar, giving ex-Chester goalkeeper Jon Worsnop a fright. And soon after, Worsnop was picking the ball out of the back of the net after a second goal from Powell. It followed a good run from the ever-busy Iain Howard. He passed to Matty McNeil, who unselfishly found Powell in a good position. Worksop tried to get back into it, with Jamie Jackson trying to make an impression with a couple of tricky runs. But Chester had the measure of him and as the match drew to a close, three players were booked when tempers started to fray. Powell, who had just been named man-of-the-match was one of those in the referee’s book, as well as Wes Baynes and Worksop’s Michael Jacklin. Powell is now just one booking away from a two-match ban. There was one more name in the book when Worksop’s Chris Wood fouled Anton Sarcevic, who’d had a relatively quiet match. Soon after, the referee blew for full-time – which was just as well, as it did look like on-the-field trouble was brewing. And as the players were coming off the field, Worsnop ran towards Taylor, to be held back from the Chester defender by a combination of home and away players. It wasn’t pretty, but it was certainly a match to remember and it was great to be a part of history in the making.